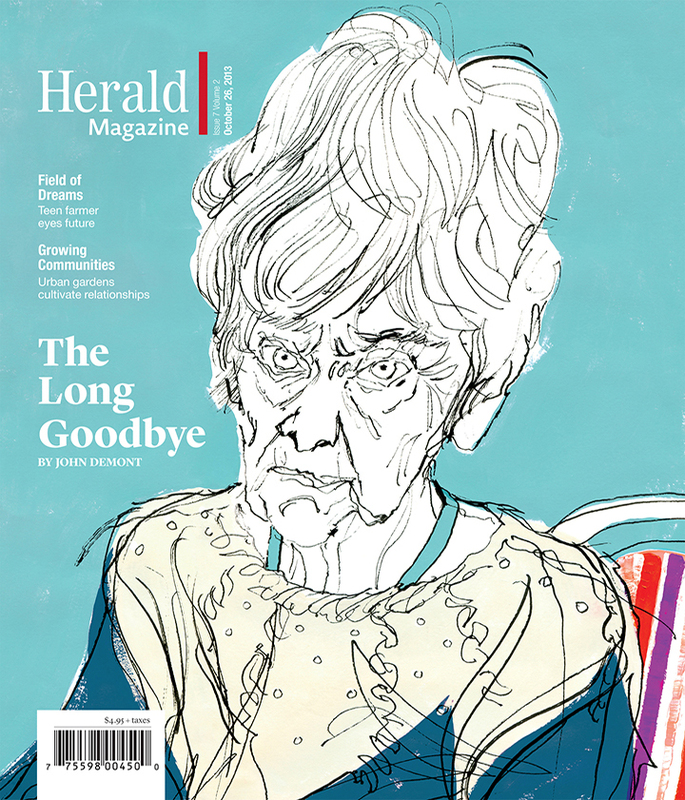 After years of struggle, and a list of day jobs longer than my arm, I finally seem to be getting somewhere: The above magazine cover, that I illustrated last October for The Herald Magazine, has been nominated for an Atlantic Journalism Award! It’s up against two photographed covers in the category, ‘Best magazine cover.’ So fingers crossed illustration wins the day. The commission was challenging, I was asked to illustrate an article about Alzheimer’s, and decided to practically move into a nursing home for two weeks in order to get the depth this very personal account of the disease deserved. Whether I succeeded or not, I don’t know, but I definitely learned a lot about the destructive nature of Alzheimer’s, and was privileged to spend time with a mother and her son, as they said goodbye. The article, written by John DeMont, has also been nominated. Results are announced on May 10th. Thanks Rosie. How are you getting on in Pakistan? Maybe you’re safely back in Wales? All the best, Russell. Congratulations on the nomination! It is a lovely drawing. Good luck! Thanks Maria, I’ll find out this Saturday how the drawing fared :-/ Thank you for dropping by, Russell. How did it do? I hope you won! Oh! It didn’t win Maria, thank you for asking. It got a silver award though which is pretty good. And the article which I illustrated won gold. So I did pretty good in the end :-) Thank you for dropping by again, and taking the time to comment. Take care, Russell. very cool, russell! congrats and fingers crossed for you! Congratulations — so beautiful and moving! Wonderful to see your great sensitivity and skill appreciated. Best of luck for the next step! Thanks Jacqueline, and thank you for the kind comments. Take care, Russell. Yahoo!! Congratulations Russell! Well, you’ve won something already to receive this nomination. But I do hope your awesome illustration wins!! Well done! Thanks Jen. Yes, I’m happy with the nomination itself, would be nice to win though ;-) Russell. Congrats! It is a haunting image. I think the fact you delved into it, lived around it, informed every line you put in there. It’s amazing. There is a vacancy in the eyes of Alzheimer sufferers, that seem like the soul is inside a prison. It’s there, I feel in your drawing. Amazing work…. as always. Thanks very much Juan, good to hear from you. I appreciate your well considered comments. All the best to you friend, Russell. Well done, Russell! It’s hard to draw with my fingers crossed, but they are crossed for your illustration to win. :D Way to go! Thank you Sharon. Yes, I’m happy enough just to be nominated. It’s a good indication I’m heading in the right direction with my work. Take care, Russell. Best of luck to you Russell. You truly deserve a journalism award in my opinion. Thanks Josh. I’ll be in the city shortly, will drop by to see how you are all doing. All the best, Russell. Oh congratulations and fingers tightly crossed for you. I remember seeing your illustrations of inside the care home and thought them touching and sympathetic to your subjects. Your cover illustration above shows a strength of character in the face despite the obvious age and frailty of the woman. Beautifully observed. I will be upset if a photograph is chosen rather than your artwork! Thank you for your comments Eleanor. Yes, this lady was a strong character, in the best way possible, and had a great sense of humour. I was saddened to learn she recently passed away. I’d promised to return to the nursing home for a visit but got too wrapped up in my own life, and left it too long. I urge anyone out there with ageing or sick relatives to just make the time! Visit, and be on good terms, tomorrow might be too late. Thanks again Eleanor for taking the time to comment. Take care, Russell. Thank you Emma. Hey, I know you illustrate too ;-) Russell. Positive thoughts, electric vibes, and homemade cinnamon rolls soon to be in the oven in celebration of the nomination, recognition and good things to follow. Thanks Jots, those cinnamon rolls sound good! The nomination (and a victory!) is well deserved. Your’s is a talent that will certainly be recognized. Thanks for your support Boxer. All the best to you, Russell. Thanks Jo. Sorry to hear about your Mum, hope she is doing well. Best wishes, Russell. I’ll have to look that one up! Sounds like something to be :-) Russell. Oh, Russell, this is fantastic news!!! Congrats, friend!! You really deserve this. Keep us up to date, please! Those drawings of people with Alzheimer (well the ones you showed in this blog once, I don’t think those were the same ones for publication, isn’t it?) were absolutely tender, sad and charming at the same time, very touching. Thank you Rosa, thanks very much. I’d like to return the compliment; your own drawings show depth, understanding, and affection for the people you know. And I want you to know that I appreciate them. Always good to hear from you, Russell.